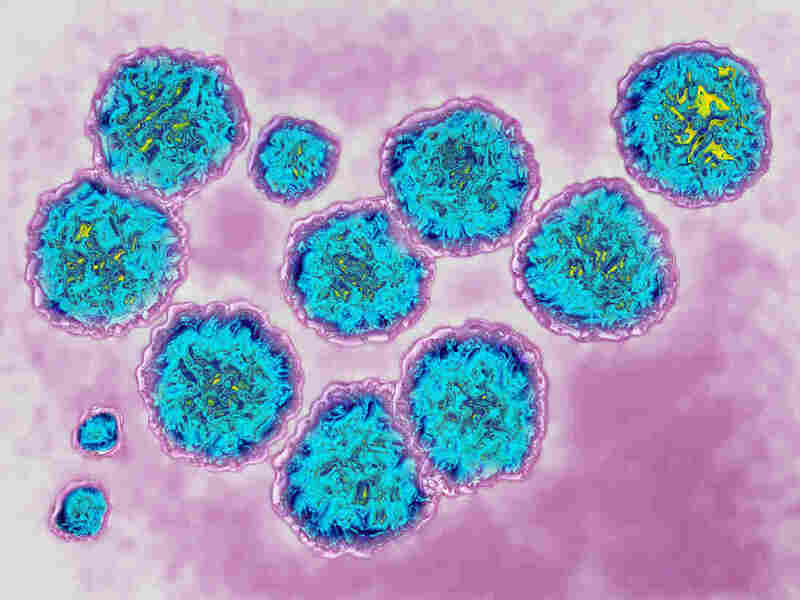 A Hepatitis C Drug's Lower Cost Paves Way For Expanded Treatment : Shots - Health News Mavyret, recently approved by the Food And Drug Administration, can cure hepatitis C in eight weeks, at a cost of $26,400. Though still expensive, that's well below the price of other options. Hepatitis C virus, via transmission electron microscopy. (The actual viral diameter is around 22 nm.) Doctors say the recent FDA approval of Mavyret, a less expensive drug for treating the virus, may make it easier for more insurers and correctional facilities to expand treatment. Valerie Green is still waiting to be cured. The Delaware resident was diagnosed with hepatitis C more than two years ago, but she doesn't qualify yet for the Medicaid program's criteria for treatment with a new class of highly effective but pricey drugs. The drug, Mavyret, is the first to be approved by the Food and Drug Administration that can cure all six genetic types of hepatitis C in about two months in patients who haven't previously been treated. Other approved drugs generally require 12 weeks to treat the disease and often aren't effective for all types of hepatitis C.
In addition, Mavyret's price tag of $26,400 for a course of treatment is significantly below that of other hepatitis C drugs whose sticker price ranges from about $55,000 to $95,000 to beat the disease. Patients and insurers often pay less, however, through negotiated insurance discounts and rebates. "It certainly stands to reason that the continual march downward on cost would lead to continual opening up of criteria," says Matt Salo, executive director of the National Association of Medicaid Directors. Hepatitis C is a viral liver infection spread through blood that affects an estimated 3.5 million people in the United States. It can take years to cause problems. Many baby boomers who contracted it decades ago before blood was screened for the virus don't realize they have it until they develop liver disease. In addition, the growing heroin epidemic is adding to the problem as people become infected by sharing contaminated needles. "Direct-acting antiviral" therapies like Harvoni, a once-a-day pill introduced in 2014 that generally cured hepatitis C in 12 weeks, are much more effective than earlier treatments that required weekly interferon injections and multiple daily pills for nearly a year. But the newer regimens came at a price: $94,500, in Harvoni's case. State Medicaid programs, which cover a high proportion of people with hepatitis C, balked at the high prices, even with the 23 percent drug discount the programs typically receive. Many threw up roadblocks to limit drug approval until the disease was advanced. Some required people to be drug- and alcohol-free for six months or more before treatment would be approved. Those moves prompted advocates to push for better access, in some cases filing suit to force the programs to cover more people. Faced with a lawsuit in Delaware, the state Medicaid program began loosening up treatment criteria this year, and in January will begin approving enrollees regardless of the severity of their disease. The state joins more than a dozen others that no longer (or never did) restrict hepatitis C treatment based on disease severity, says Kevin Costello, director of litigation at Harvard Law School's Center for Health Law and Policy Innovation, which has been a key player in litigation in Delaware and other states. It can't happen soon enough, says Green. She is 58 and believes she contracted the disease 31 years ago when she suffered complications during childbirth and required a blood transfusion. Although her liver isn't damaged, Green says, she has suffered with abdominal and joint pain, weight loss and fatigue for decades – all symptoms her doctors attribute to the hepatitis C virus. "It's been a difficult fight for us Medicaid patients," she says. People who are incarcerated face an even tougher battle to get treatment for hepatitis C. A recent study of state prisoners suggested that roughly 17 percent of prisoners are infected with hepatitis C, compared with about 1 percent of the general population. Prisons have a duty not to be deliberately indifferent to the medical needs of incarcerated people. Prisons don't get the price discounts that the Medicaid programs have, and their budgets are fixed. "Administrators have to make do with what is there," says Dr. Anne Spaulding, an epidemiologist and associate professor at Emory University's public health school, who has worked as a medical director in corrections and published research on hepatitis C among prisoners. Lawyers in a handful of states are pursuing class action lawsuits to force prisons to provide hepatitis C treatment. Mavyret may make a difference, says David Rudovsky, a civil rights lawyer who's litigating a class action lawsuit against the Pennsylvania Department of Corrections. "Everyone recognizes that it's going to make it easier to cover people," he says. Coverage for drugs that treat hepatitis C is typically less problematic for people who have private insurance (though some obstacles remain). For example, Mavyret is one of seven hepatitis C drugs that are included in the 2018 national preferred formulary by Express Scripts, which manages the pharmacy benefits for 83 million people. "The benefit to patients and payers is the additional competition, which brings down costs across the class, thus resulting in greater access and affordability," says Jennifer Luddy, director of corporate communications at Express Scripts.